Sifu Ian began his adult martial arts training in 1998 at the National College of Karate in London. 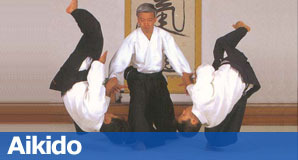 The style studied was Mu-gen-do, a modern martial art created by Master Sensei Meiji Suzuki, meaning The Unlimited Way. Mu-gen-do is a Karate based art with western boxing and grappling influences. During his time at the National College of Karate Sifu Ian also trained under Sensei Rafael Nieto, a 5th Dan former British, European and World Kickboxing Champion. Being taught by Sensei Raf and other instructors involved with Kickboxing, Sifu Ian’s focus moved towards Kickboxing, spending the next few years training at the Lennox Lewis Boxing Centre in London with Kickboxing instructor Dino Meringo, a Black Belt instructor of Mu-gen-do and a professional Kickboxer with competition experience. In 2003 Sifu Ian moved to Canada, and after spending some time looking for the right school to train at he found and joined Island Kung-Fu. With several years of Martial Arts training already in place, Island Kung Fu gave Ian the mix of workout and Self Defence he was looking for, and 2007 was awarded his Shaolin Kempo Black Belt and in 2008 his Shaolin Green Sash. Since moving to Canada Sifu Ian has achieved many of his goals, the most exciting one was starting a family with his wife Chantal. He now has two beautiful children, Oliver 11 and Lily 9. Keeping with the schools family atmosphere, Oliver and Lily have both begun their own Kung-Fu journey through the Island Kung-Fu family program. 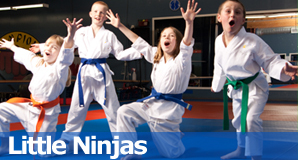 Island Kung-Fu is located on Charlotte Road, Duncan in the beautiful Cowichan Valley. The 2100sq. ft. facility boasts a large training area with a large array of training equipment. 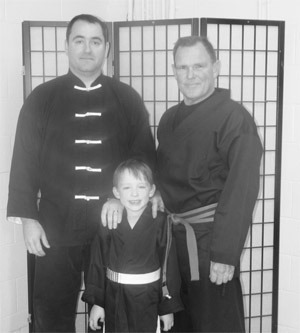 "A while back a good friend of mine, Dave, was telling me about this family Kung Fu school in Duncan that he, his son, daughter and wife joined. Being respectful and true to my friend I listened, smiled and said "that's nice" while inside I was telling myself is he kidding? I didn't think much more about it after that. Months later he pulled me aside and said "hey Kim, check this out". He then proceeded to pump out 55 perfect push ups in under a minute. My jaw dropped. Dave, like me is a pretty big guy, not overly athletic and is in his late forty's. I was now all ears as he explained the virtues of Kung Fu. Real Estate sales is one of those sedentary occupations that finds one spending long hours behind a desk, meeting with people and driving around in a car; not the physically challenging job of say a logger or framing carpenter. Finding the time and inspiration to get that much needed exercise balanced with quality family time is truly a challenge. That's where family Kung Fu now comes in. My wife, two sons and I joined up and it's now part of our lives and our weekly routine. 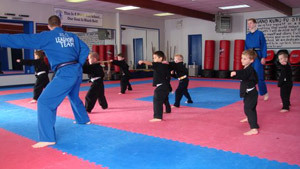 Aside from the general fitness benefits of Kung Fu there's a focus on developing flexibility, stamina and new motor memory skills as well as the obvious self defence skills taught in this age old martial art. The discipline and structure are refreshing and to my surprise welcomed by my 10 year old boys who now display a new found inner confidence that grows with each new belt earned. I myself enjoy the discipline and structure which I notice that I had missed from my past career in the military. I also enjoy the camaraderie of my Kung Fu classmates and have made many new friends with similar goals. 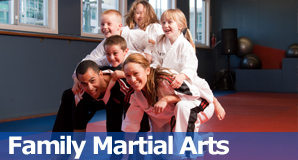 As a family activity Kung Fu gives us a rare opportunity to do something fun together where we are all equals working on a common goal; to earn the coveted black belt. "